Beautiful construction. Holds one 6" tile. Comes with a 6 section lift out tray. Both the box and tray have a light tan fabric liner. Hinged lid. 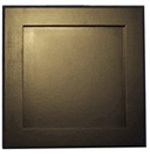 Outside dimensions: 7 3/4" sq. x 4 1/4" tall. Tile not included and is sold separately. For use with a 4 1/4” x 4 1/4” tile. Holds one 4 1/4" tile. Lacquered ash with Rosewood stain. 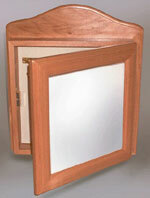 These high quality hardwood boxes are fabric lined. Fits a 4 1/4" tile. Outside Dimensions: 6 1/2"sq x 2 1/2". 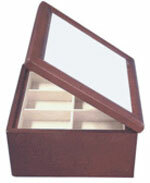 These high quality hardwood hinged boxes are made to fit your 4 1/4” ceramic tiles and make a beautiful gift item that will sell for you. Outside Dimensions: 5 1/4"sq x 2 1/8". 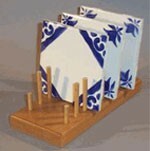 Display your tiles with this handsome display rack. Hold up to 7 tiles of any size. Tiles not included and are sold separately. 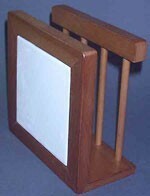 Display your tile with this great looking frame. Each frame features a drilled "key hole" for hanging on the wall and four rubber pads to protect surfaces when used as a trivet. Order a full case of 80 & save on shipping! Create more value with these great frames. Exceptional quality. Drilled "keyhole" on back for hanging as a frame and rubber pads for protecting surfaces when used as a trivet. Order a full case of 20 & save on shipping!